Makeup or Pencil case with tropical design. Featuring flamingo's cheetahs and peacocks. 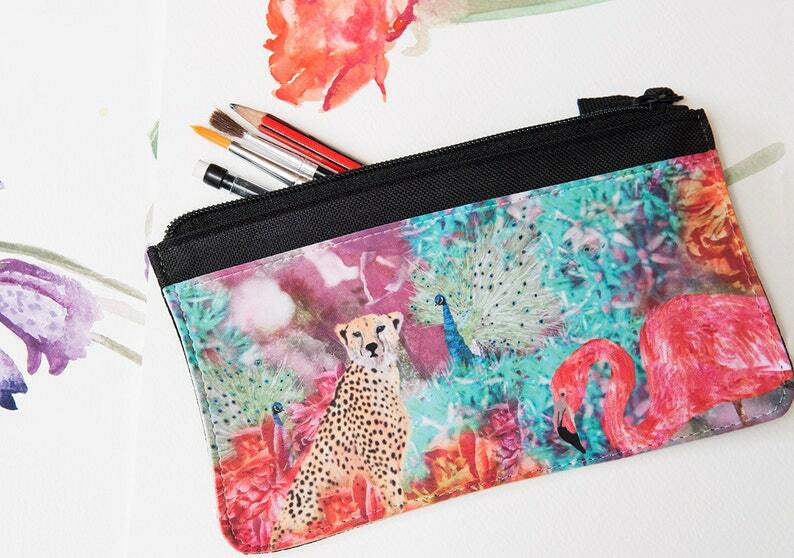 This tropical zip pouch is perfect to use either as a makeup bag or pencil case. It has a fun bright tropical design featuring a flamingo, peacock and cheetah. Its digitally printed polyester with a black zip and black reverse. I created the illustration by collaging watercolour paintings and bright bold photographs, taken of flowers I found in my Grandmothers garden. I use this to carry my essential makeup during the day, but it is also perfect to be used as a pencil case. I love this sweet mug. It is a smaller size and a perfect fit for my hands. The orca print is gorgeous! The seller shipped very quickly. I am very happy!! If you are unhappy with your purchase then please do let me know. Together we will find a solution whether thats a full refund or an exchange. I will post items within two working days. With the exception of Christmas decorations which I hand make to order so these may take a few extra days. I am as excited about you getting your product as you are, so I really do get it into the post as quickly as I can. I make sure everything is packaged nicely so that your product gets to you in excellent condition. I am always happy to create custom orders. So if you want one of my designs printed onto fabric for an upholstery project, or you like a cushion but would rather it in a different colour then just get in touch.